Grab your EMPOWERED tee HERE. I am a mom of 2 boys! My first son Beckham was 3 1/2 weeks early, and I was not in the mindset of labor yet. My plan was to have a natural birth, but I didn’t want to put too much pressure on myself, and wanted to make sure I would be willing and able to accept an epidural. The worry at the time was pre-eclampsia. We set up an appt. for the next day and they started the process. They started me on Cytotec which is a cervix ripener. This was because I was not dilated at all. We did that for 8 hrs all through the night and nothing! My body was not ready, so we then started Pitocin. We were well on our way. 24 hrs later I was not able to get comfortable, and or get any rest. My stubborn cervix after all that was still at 1!!! I was feeling very defeated. We made a plan that I would try to get some sleep, and at around 10am we would break my water and hope for the best. Since waiting it out wasn’t really an option at this point. Me and my little guy would be in danger of complications. That night I was able to get about 5 hrs of on interrupted deep sleep, which I felt was a miracle. I showered, ate a small breakfast, the nurses braided my hair, and a little bit of makeup of course. Pitocin was rolling, and I was feeling strong and hopeful! 10am my water was broken and the real laboring started! I hard labored for 8 hours. The midwives, and nurses coached me through breathing and pressure points to help me through the contractions while my husband was by side every step of the way pushing on my knees and keeping me awake. The laboring was intense. I was throwing up in-between each contraction, and after 8 hrs of this I was exhausted and literally falling asleep during my contractions. This was making it extremely hard to breathe, stay calm, and not put the baby in distress. My husband and I were alone in the room for a brief moment and made the decision it was time for an epidural. At that very moment my midwife was consulting with other doctors in the hall, and they had come to that very same conclusion. Everything happened so fast. My fears of Needles, my fear of just getting an epidural, and the sadness of feeling like I wasn’t a strong enough woman to make it through this birth without an epidural, all went away. I was feeling elated and at peace. as I started to drift asleep since my body no longer was in Stress mode, and my cervix finally dilated. The baby’s heartbeat was steady, and all the sudden it was time to push! Go figure! Within an hour of getting that epidural it was time to push! 3 good pushes and my first child was born. In that moment everything I had gone through felt like nothing. Giving birth to my first son was honestly the hardest thing I have ever gone though. But being able to feel the pains of labor, yet also having the experience of modern medicine was amazing! I felt loved and supported the whole way through with my midwives and nurses. I don’t regret anything, and I am proud of myself. I feel empowered that my body can do such amazing things! My second son was a totally different story, my whole pregnancy was hard and full of disparity and sickness. My first pregnancy was honestly bliss compared to this one. I found out I was pregnant 3 months postpartum after my first baby, and I couldn’t seem to wrap my head around why, or how this could happen. I struggled through feeling somehow that it was a punishment and of course my hormones where all over place. I was depressed. I think with all those feelings it played a huge part in the type of pregnancy it was for me. All my negative emotions manifested through pain and sickness. I wanted to have that baby ASAP, and ended up going into the hospital 3 different times thinking and hoping I was in labor. When you are in labor...YOU KNOW! I was just dying to get him out. I knew I was in labor when I woke up in the middle of following night feeling strong contractions. The timing in-between was right. I was throwing up through each of the contractions! I labored at home for about 6 hrs and my water hadn’t broken yet. I held off going in, because I didn’t want to just be sent home again like all the other times. But when we came into hospital everything happened swiftly! They broke my water and asked if I wanted that epidural, “now or never” was the vibe because I was dilating so quickly. I had already made the decision before hand I wanted one this time, so it was an easy decision. From the time I entered the hospital doors, to the time of birth was 2 hours! 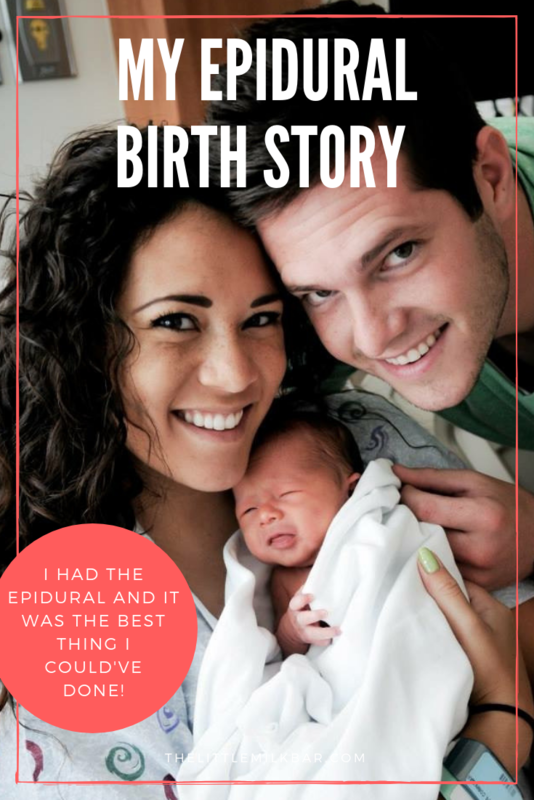 My midwife was Efficient and supportive, and I was happy with my decision to have an epidural. Every woman is entitled to whatever kind of birth they want, and I am not ashamed or feel less empowered as a women to say I loved having an epidural! Birth can sometimes be unexpected, and we can’t always have control of what happens, but there is nothing more special than holding that sweet baby knowing somehow you were a part of bringing life into the world. It’s a special thing, and I wouldn’t trade it for anything.